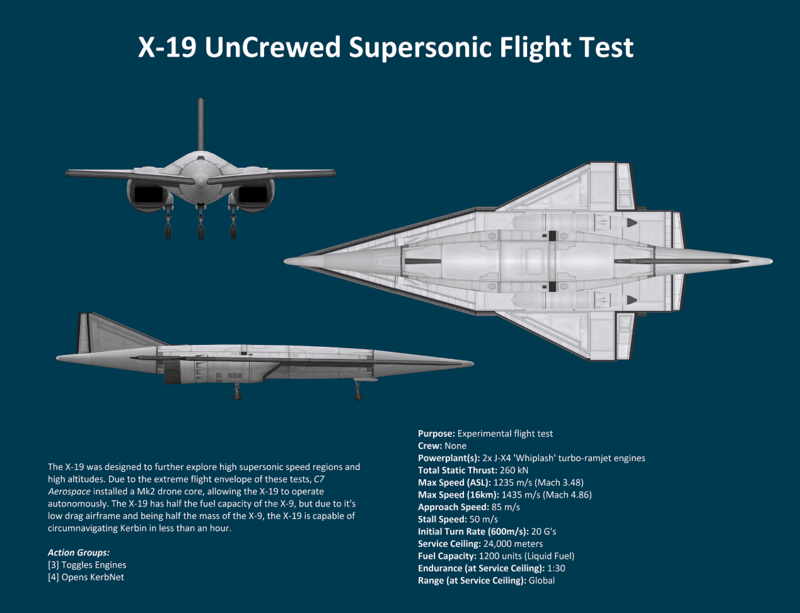 The X-19 was designed to further explore high supersonic speed regions and high altitudes. Due to the extreme flight envelope of these tests, C7 Aerospace installed a Mk2 drone core, allowing the X-19 to operate autonomously. The X-19 has half the fuel capacity of the X-9, but due to it’s low drag airframe and being half the mass of the X-9, the X-19 is capable of circumnavigating Kerbin in less than an hour. WARNING: Disengaging SAS or attempting maneuvers at high speeds may result in loss of aircraft control, component damage, or in-flight airframe disintegration.